It all started with at a Public Meeting in March 1989……. Then a Steering Committee was elected to form a Halls Head Bowling Club. The Committee accepted Mandurah Council offer of land for Club use at the corner of McLarty and Calypso Roads, Halls Head. 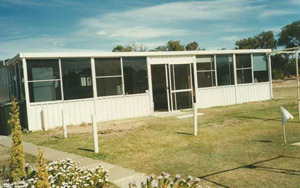 At the Club’s first General Meeting in November 1989, the Water Authority advised it would not approve the building of a Bowling Club on the site. Town & Country offered an alternative site in Bridgewater for use as a Bowling Club “In Perpetuity”. With a 1.6ha bushland block, the development of the Halls Head Club was about to begin. The Foundation Members first visit to the Club site. Late 1989. Our First Clubhouse. The (current) Machinery Shed. On 28th October 1992, our Second Clubhouse - a transportable building and two bowling greens were officially opened by the Hon. Wendy Fatin. Four years later, on 13th September 1996, Arthur Marshall MLA officially opened our Third Clubhouse, which we are now enjoying with our modern clubhouse facilities, and our third green was in place from 2000. The Club joined in a partnership with the Peel Social Bowling Club in 2014, who in addition to having their own members bowling, cater for people with various disabilities. Our fourth green of 5 rinks was installed in 2014, primarily for the use of Peel Social bowlers. We now have three synthetic greens (2 x 7 rinks & 1 x 5 rinks) & one carpet green of 7 rinks. 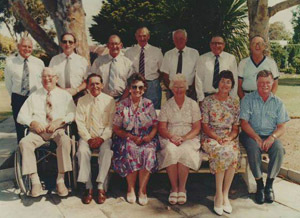 We’ve come a long way since 1989 and now enjoy the company of ALMOST 700 members from our vibrant local community. International and interstate visitors are commonplace. “AGAINST THE OVERWHELMING ODDS” is available for Members who are interested in the early Club history from 1989 to 1996. Conveniently located, just 2kms south of central Mandurah City our club is nestled between the picturesque estuary of the Peel Inlet and Indian Ocean. Halls Head's first Management Committee. Say hello to that young bloke on the bottom right. Bob Williams is the only one still with us. 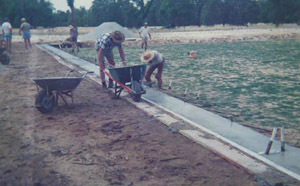 Laying the first greens. Volunteers mixing cement by hand.